Sadly Fred became very old after Christmas and mid January 2005 I took him to the vets where he was put to sleep. Fred was named after the character in the Scooby Doo movie, in the summer of 2002, as he has neat, blond fur. He had a huge cage to run around in and two wheels including a Wodent Wheel. He particularly liked to eat walnuts and hazelnuts. Fred had the Peter white bar cage which I bought from petsdirectuk.com, but it is not available there any more. Cuddles was living was us for a year, but passed away in May 2004. I adopted Cuddles in July 2003 but he was already a year old which made him about the same age as Fred. He was a very soft hamster, but he was not used to being handled and I had to teach him not to jump out of my hands. He was always shy and did not like to come out to play until it was dark. But when he was out he was quite keen on trying to climb up things, including the inside of my trouser legs. If I put food in his bowl he always come out to get it. Cuddles had the Gimmy white bar cage from petsdirectuk.com with just one of the extra levels where I fixed a large new wheel to the side of the cage. Fred was quite territorial and would chatter his teeth at Cuddles and become quite angry if they meet nose to nose through cage bars. If Fred was inside his cage and Cuddles outside then Fred would act very aggressively. When I removed Cuddles, Fred would jump around in his cage and climb up the bars looking for Cuddles. If Fred was outside Cuddles' cage then Cuddles will just sit and sniff at Fred, but I would have to drag Fred away because he would act aggressively with his teeth chattering and his muscles tense. However, Fred would ignore Cuddles' cage unless he found Cuddles at the bars so it was safe to have Fred out with the light on and Cuddles in his nest. When they were both in their cages they ignored each other, even if the cages were next to each other, except for occasionally listening to a noise that the other made. Pippin arrived just before Christmas 2001, named after the character Pippin in Lord of the Rings as he was small and liked to cause trouble. He was very active and very good at jumping. He became ill in spring, seemed to recover with some medicine but then died at the beginning of summer. Neo joined my hamster household in November '99 and was a very large, strong hamster. When he was out of his cage, he would run around everywhere and regularly disappear. I went on holiday in May '00 and he spent a few weeks being looked after by a friend. He had a great time and came back full of beans. His favourite activity while he was on his holiday was to climb up the curtains. His treats were yoghurt drops, cucumber, shredded wheat, pasta, rice and milk. 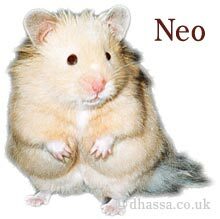 Neo sadly passed on to the big hamster wheel on 14th Dec 2001. He had been old and occasionally ill for a few months, with some good days when he would walk around the room and bad days when he stayed in his nest. Petra joined the household while I still had Muffy and Archers. She was rather fat when I purchased her from the pet shop as she did not had a wheel to exercise in and she was a full grown hamster. When she came home she went into a cage with a wheel and then ran on the wheel non stop for one hour. She was a very peaceful hamster and very laid back about being picked up. Archers was a manic, little dwarf hamster. She loved to eat sunflowers seeds. As soon as I gave her a sunflower seed she would crack it open, stuff the seed in her cheek pouches and keep it in her pouch until she ate it. She also loved to eat hamster hoops. Archers passed on to the hamster wheel in the sky in May 2000. She was a very old dwarf hamster, about two and a half years. She had grown wrinkly, but was still very active. 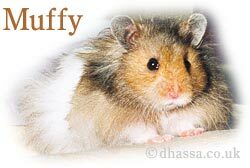 Muffy lived with me for about three years. He was very lively and very inquisitive. When out of the cage he would try to track down Petra. I would roll Petra's empty ball around the floor and he would follow it. He would rattle and bang the cage door if I was in the room and he wanted to come out of the cage. This is the list of all the hamsters that I have provided a home for, with the help of my parents when I was young. Fred, male short haired syrian with cream coloured fur, pale ears and black eyes. Pippin, male chocolate brown syrian. Neo, male long-haired blonde syrian with cream coloured fur and ears and dark red eyes. Petra, female long-haired golden syrian. Archers and Baileys, female Campbell Russian Hamsters, cream (argente) coloured with red eyes. Muffy, male long-haired golden syrian. Wally (Wallace), male golden syrian. Noel, male long-haired white syrian.